Abstract. "Tactigraphy" is a new, non-invasive and very economical stamping method, which allows the fast recording of planar engravings with a so far unexcelled quality. It takes advantage of the totally impervious 19 g/m2 Mousseline paper of BOLLORE TECHNOLOGIE as well as the combined black/white inversion and rastering capability of the laser-copying machine of RICOH. Tactigrammes of engravings with labrymorphic and labyrinthic symbols are displayed. Year +105 is an important date. According to legend it has been 1890 years since the Chinese invented an extraordinary material called paper (but it took eleven centuries for this invention to become known in Italy). Shortly after inventing paper, the Chinese then invented stamping. The 1400 years old engravings in the Longmen caves might well have been made to be stamped (Melot 1981:8). The paper was moistened, then beaten to map precisely the embossment and finally ink-padded. The technique of beating paper is still in use in China. I am nevertheless convinced that such treatment outrageously damages the rock surface. In addition, Chinese hand-made paper, despite its exceptional qualities, has a major draw-back; it has "pin-holes" through which the black ink can seep. In order to avoid these problems two new high performance technologies were applied, BOLLORE and RICOH. From this approach the idea of tactigraphy was developed (Dubal, Larrey and Spiro 1993:25-27; Dubal and Larrey 1993; Dubal 1994:51 and 1995:5). Paper, carefully selected: Roll, 33 cm. wide (ideal size for copying machines), 19 g/m2 Mousseline paper, BOLLORE Technologies (the producer of the well known "Zig-Zag" cigarette paper). This paper is completely impervious to ink. Water Sprayer (for in-door plants), to wet the rock as well as the inner side of the paper. Mop Roller (for radiator dusting), to emboss the paper into the engravings, i.e. to replace the "beating in" with a "rolling out" process of removing air bubbles caught between the paper and the rock. A piece of stiff felt, impregnated with a water soluble black colour, and a so-called Japanese roller (manufacture from hard synthetic foam) to stamp lightly, the patterns in relief on the paper. RICOH Technology is now applied. With the DS320 copying machine the stamping is submitted to black/white inversion, rastering and reduction to practical sizes. The pieces are then assembled by hand into the final tactigramme (Fig. 1b). Fig. 1. Tactigraphy: a spin-off of two advanced technologies. 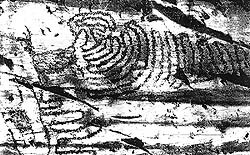 a) Non-invasive stamping tools (photo: Sellero site, Valcamonica). b) Advanced Copying (composed tactigramme). Fig. 2 recapitulates pictorially the steps involved in tactigraphy: (1) after having moistened the two contact surfaces (rock and paper) the air bubbles are rolled out, (2) the actual "stamping" of the engraving, and (3) the processed stamping with the laser copying-machine exposed with a reference metric scale. Fig. 2. Tactigraphy step by step (at the Zurla site, Valcamonica). a) Air-bubble removal. b) Stamping. c) Processed stamping (Tactigramme). Fig. 3 shows a tactigramme, displaying a labyrinthine symbol, recorded at the Zurla site, Valcamonica, Italy. Fig. 3. Labyrinthic symbol (Tactigramme, Zurla site, Valcamonica). Fig. 4. Labrymorphic symbol (Tactigramme, Votive Stele, Museum of Carthage). Fig. 4 depicts an application of tactigraphy in a protected environment, a tactigramme of a Punic votive stele in the National Museum of Carthage. The labrymorphous symbol represents the goddess Tanit. The very fine construction lines still clearly visible after 2300 years. A selection of tactigrammes of Punic votive stelae has been recently published (Dubal and Larrey 1995). DUBAL, L. 1994. Tactigraphy: a new method for epigraphy. Bulletin Centro d'Etudes et de Documentation Archeologique de la Conservation de Carthage, Vol. 14, p. 51. DUBAL, L. 1995. La tactigraphie, une nouvelle methode de relevé des gravures lithiques. International Newsletter on Rock Art No. 10, pp. 22-24. DUBAL, L., and M. LARREY 1993. La tactigraphie, une méthode de innovative dans l'art de l'estampe. Proceedings of the Valcamonica Symposium, October 6-11, 1993. Centro Camuno di Studi Preistorici, Capo di Ponte. DUBAL, L., and M. LARREY 1995. L'énigme des stèles de la Carthage africaine - Tanit plurielle. L'Harmattan, Paris. DUBAL, L., M. LARREY and L. SPIRO 1993. Procédé tactigraphique et sémiologie matrilinéaire pour l'exploration de 243 stèles votives de Carthage. Bulletin Centro d'Etudes et de Documentation Archéologique de la Conservation de Carthage, Vol. 13, pp. 25-27. MELOT, M. 1981. La Nature et le rôle de l'estampe, L'estampe. Skira, Geneva.